About us: Private Mexico Tours offers tailor-made private and luxury tours for individual travelers, couples, families and small groups. We are specialized in composing exclusive tours which are fully customized to the needs and wishes of our clients. 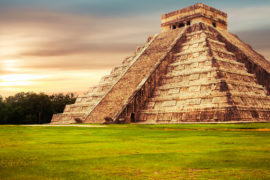 With our experience and expertise we can assist you in planning your dream trip through Mexico. Our customization concept has no limits! Our staff is extremely passionate and we have experienced professional guides who are biologist or naturalists that participate in research and protection projects in the Mayan World. Our personnel would be more than happy to assist you in creating the holiday of a lifetime so you can have the best experiences and unforgettable memories. Private Mexico Tours belongs to the sustainable tour operator EcoColors, which is located in Cancun, Mexico and was founded in January 1997 by Miriam and Kenneth Johnson. EcoColors designs and delivers tours in the « Mayan World », both biologically and culturally one of the richest regions of the world. Thanks to the professionalism and the long experience of EcoColors and its staff, Private Mexico Tours can realize your personalized dream trip. We raise awareness of the importance of the ecosystems in Mexico by teaching travelers about the nature and history of our country and region. We work with other companies and organizations that are working with ecotourism and adventure. In order to provide the best information to travelers, all our guides are educated in the scientific and biological field. By giving information as detailed as possible it seeks to minimize the impacts of the tours on the ecosystems. We make donations to projects that protect the Mayan nature. Private Mexican Tours offers innovative, luxurious and customized ecotours in order to fully realize the desires of our clients and to give them an unforgettable Mexican experience. We look forward making your dream trip come true!